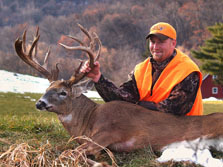 Opening weekend at Bluff Country Outfitters produced a nice 12 point buck for Vance Vinar of Fairbault, Mn. 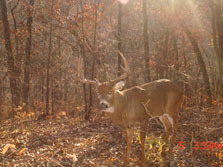 The buck dressed out at 205 lbs. and scored 151 6/8 P/Y. 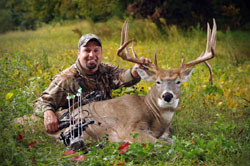 Congradulations Vance on a nice buck. 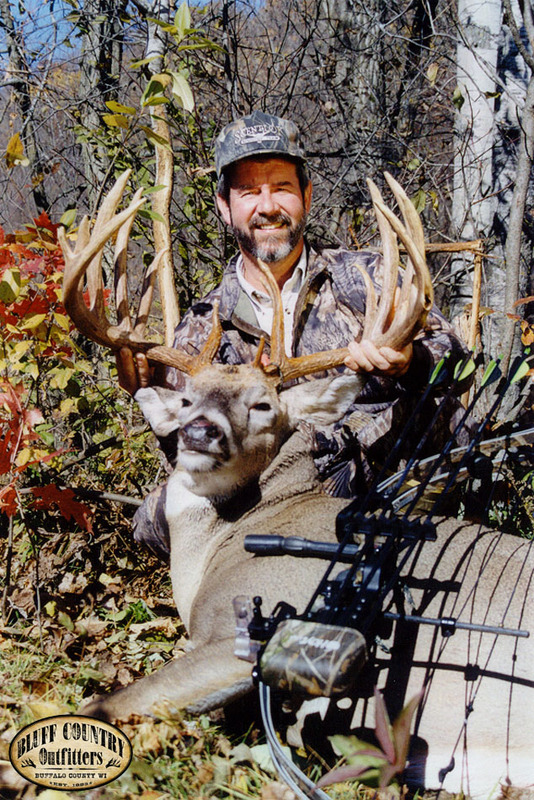 After years of photos and close encounters, longtime friend Troy Muche of Mayville, WI, downs the infamous Flyer Buck. 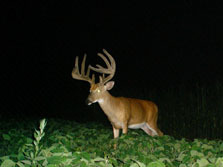 Troy took the 6+ year old deer the evening of Sept. 19th on his adjacent property. 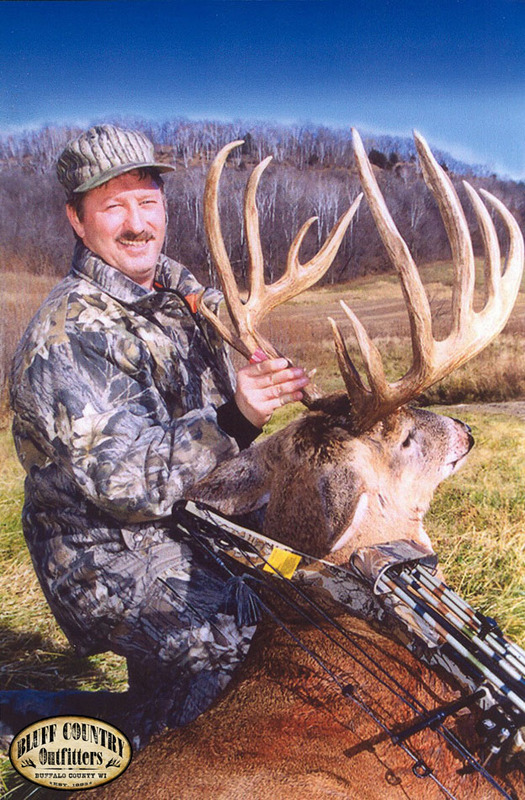 The buck gross Scored 187 1/8 and netted 183 5/8 NT. 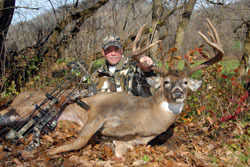 The buck had a 23" inside spread and a 10 1/2" Forked Flyer! 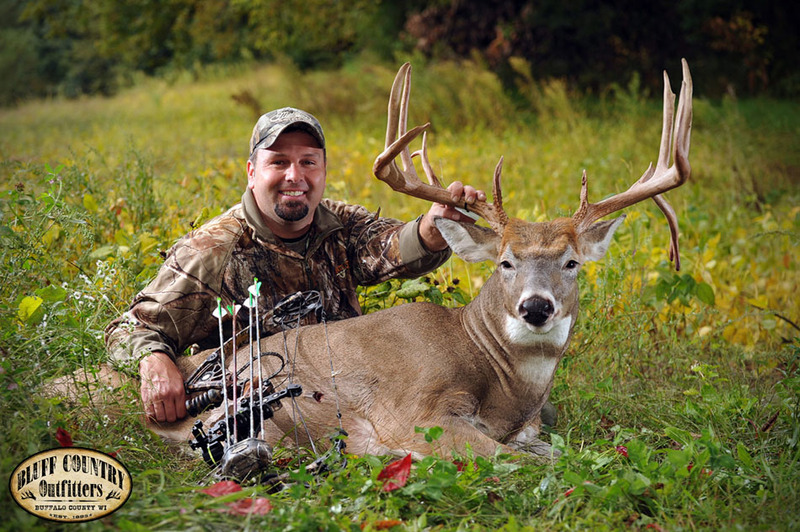 Congratulations to Troy on the Buck of a Lifetime! 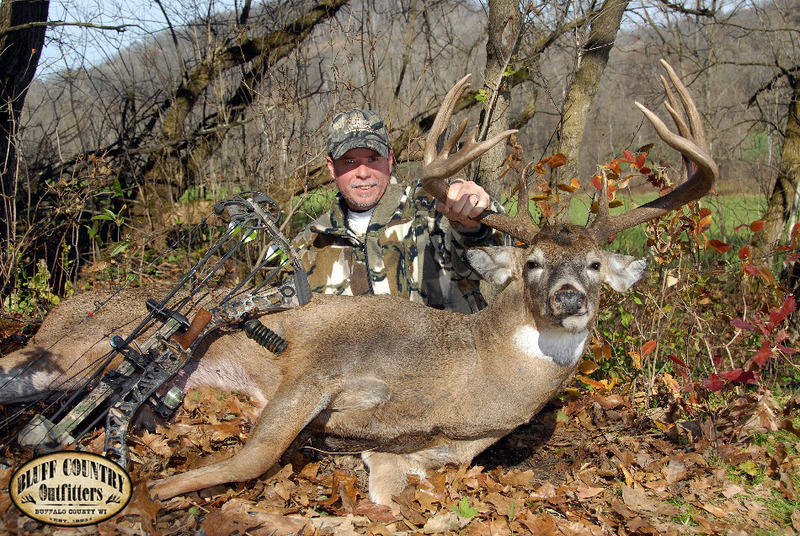 A much talked about Buck called 'Double Wide' was downed by Geno Oleson on Nov 6th. 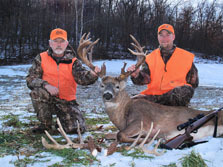 Hunting with his son Trevor on the neighbors property, Geno said his knees were knocking as the 24 inch wide buck approached. 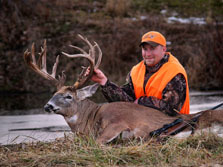 Congratulation's Geno on another great buck. Gross P/Y score 178. 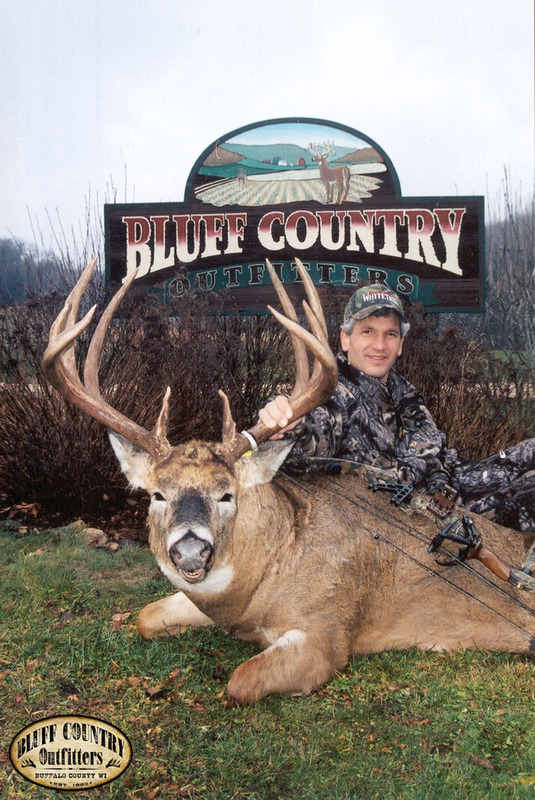 A buck well known to Bluff Country Outfitters was taken opening week end by Dustin Oesau, son of good friends Kathy and Craig Oesau. Last January, Dustin picked up these shed antlers from the buck. 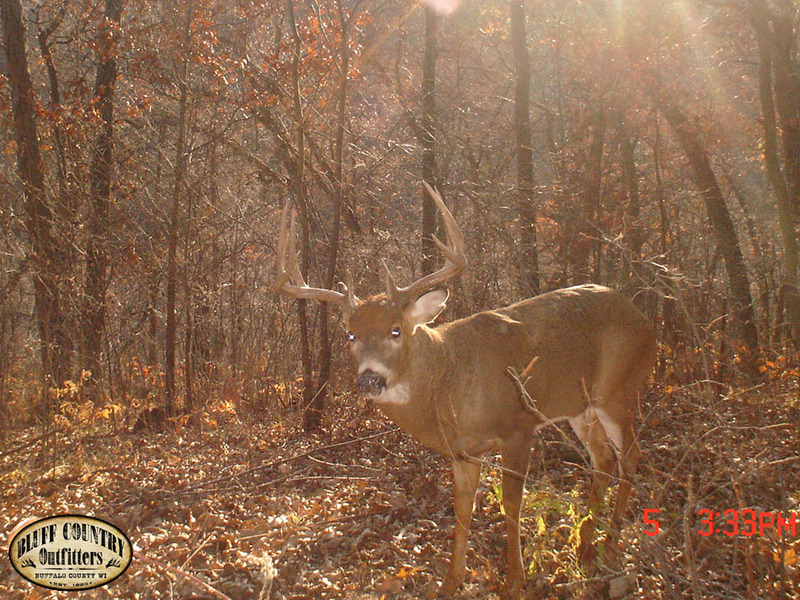 Along with trail cam pictures and sightings, the buck had sparked a lot of interest in the area. 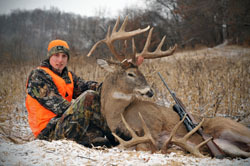 We were all very excited for Dustin when he connected on a buck of a lifetime. 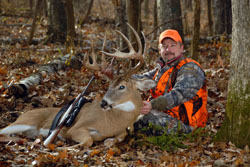 Congratulation's from us all on a well deserved buck. 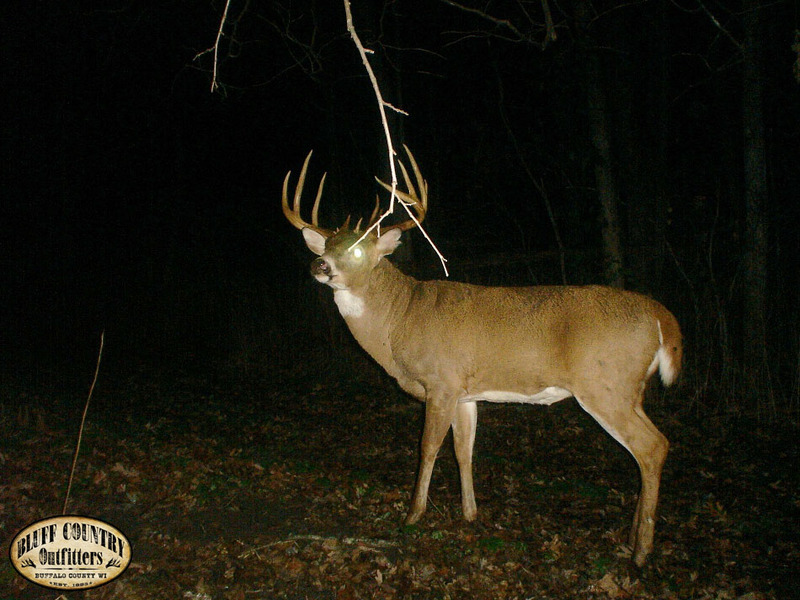 For the past 3 years the neighborhood has been in pursuit of a buck called Kryptonite. 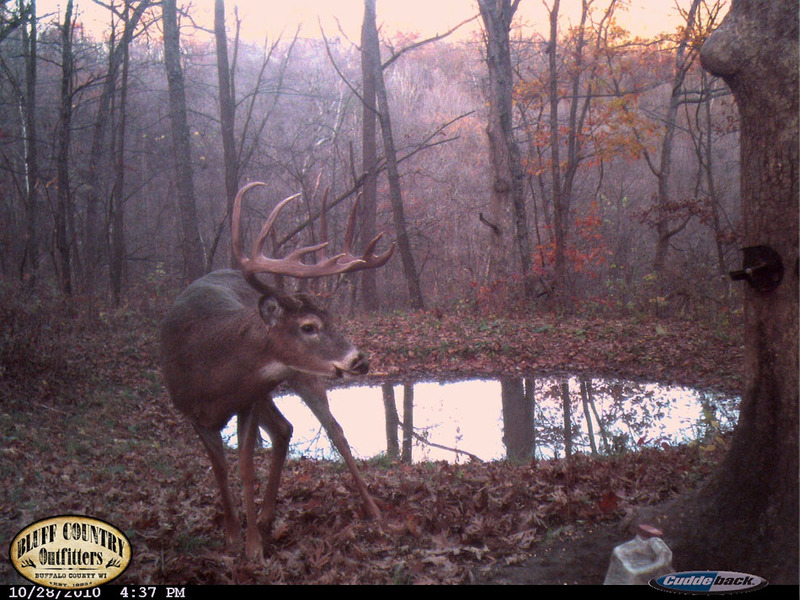 Numerous trail photos and several encounters has had hunters very excited. 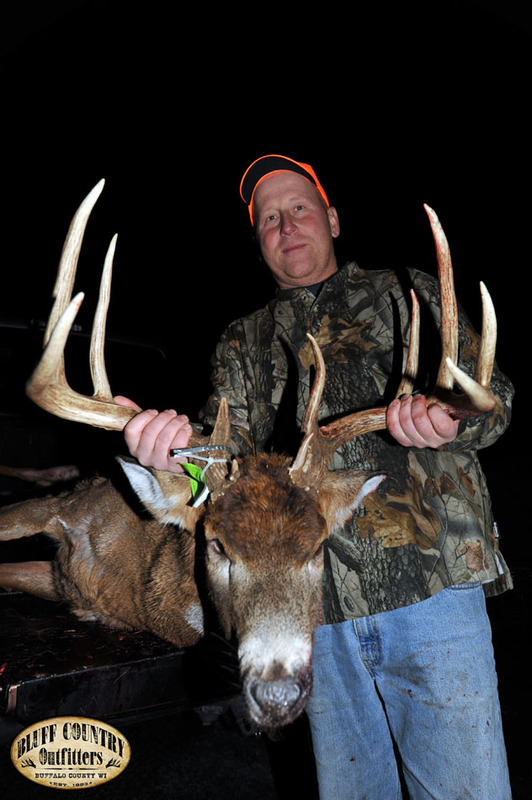 After 3 years of hit and misses the buck called Kryptonite was downed by Mike Lankey of Stoughton, WI. 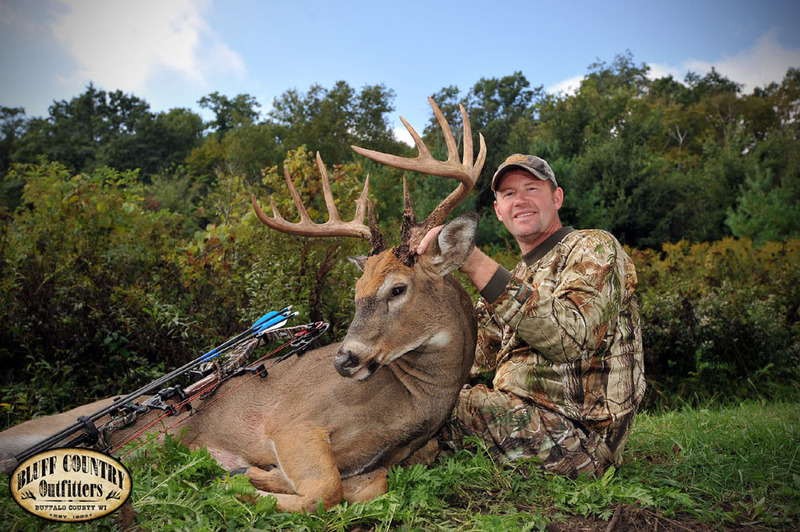 Congratulations Mike on a great buck. 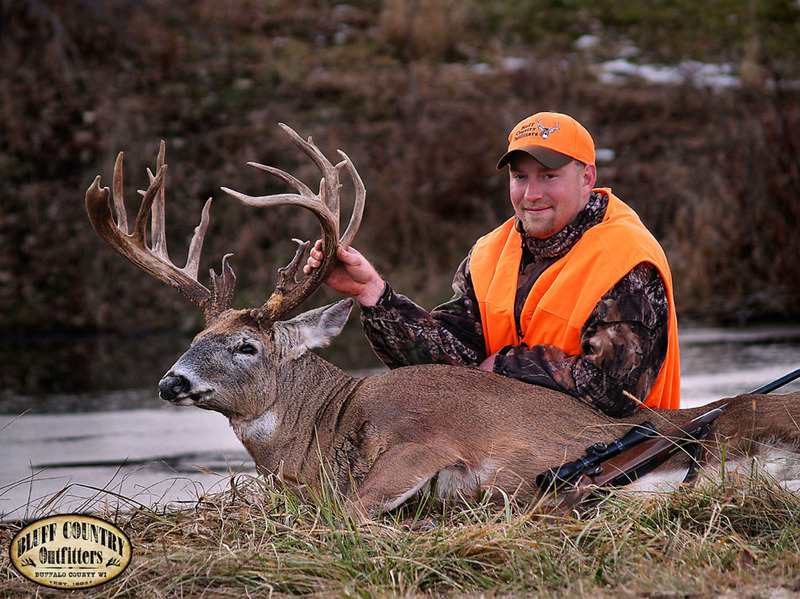 On December 5th, Bluff Country's guide, Dan Treankler took this brute of a buck with his muzzeloader. 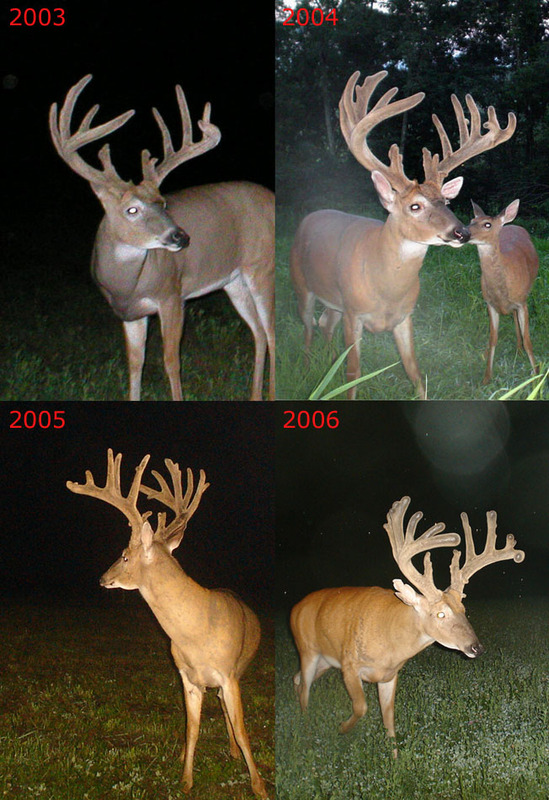 With 7 in bases, we estimated the buck to be 7 years old. Congratulation's Dan on a real monarch! 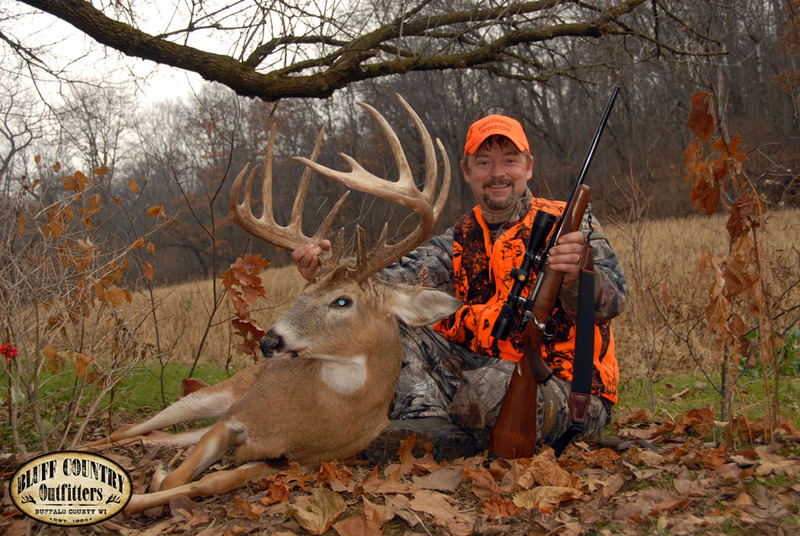 On Oct 30th, Jim Burrington from La Crosse, WI. took this 183 inch buck. It had 27.5 inch main beams. 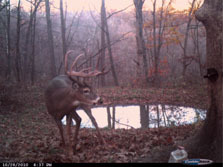 Neighbor Tim Voigt's trail camera captured this photo about 20 minutes before Jim shot the buck. This was the only picture Tim was able to get of it. 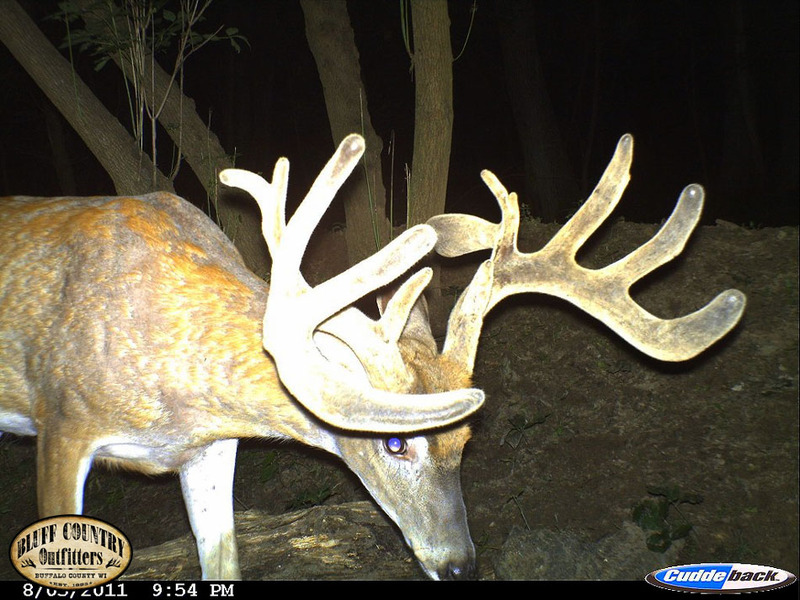 Bluff Country Outfitters's trail cameras had not gotten a photo of the buck. 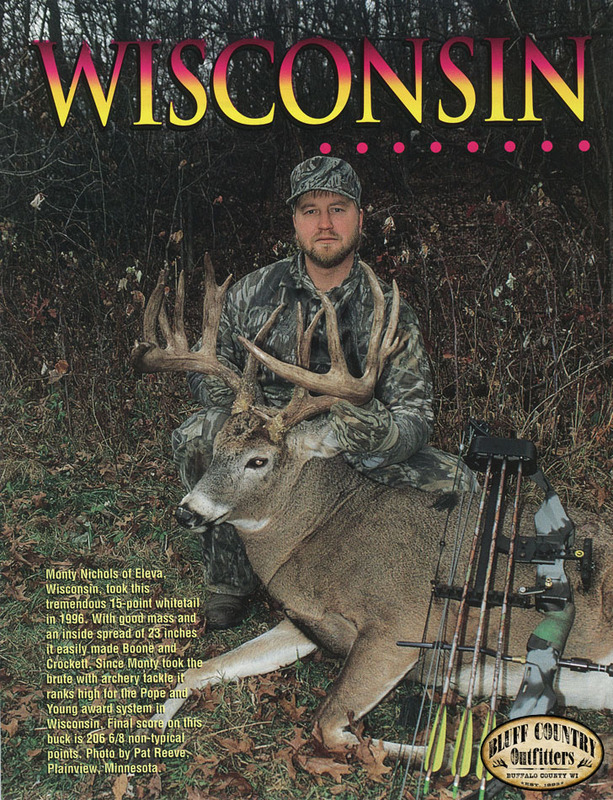 Solon Springs, WI resident, Larry Kline, has hunted with Bluff Country Outfitters in the past, check out Trophy Room 2006. 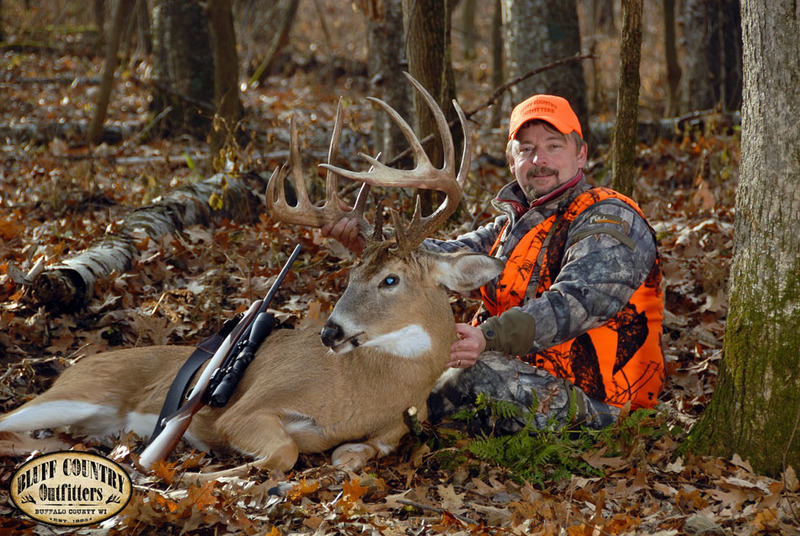 Over the years Larry has taken many good whitetails including a 229in non-typical in 2004. 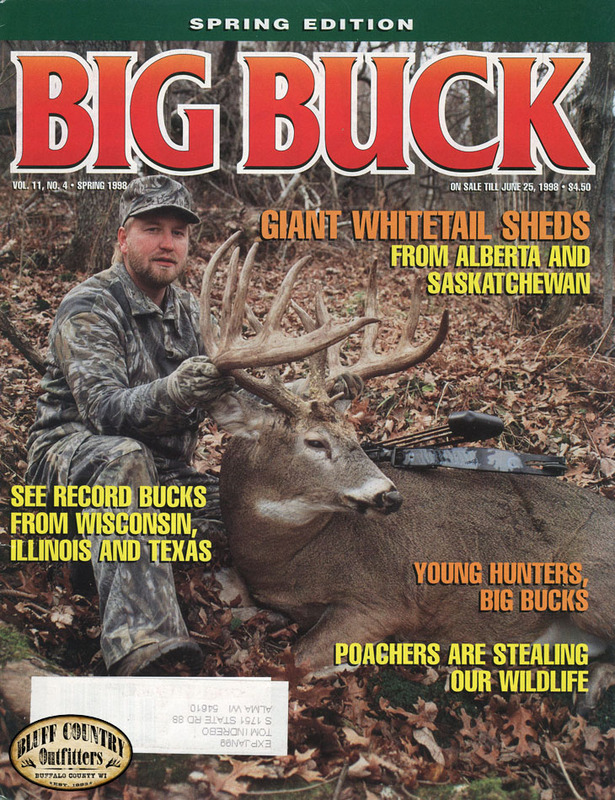 The buck, nicknamed 'Ghost Buck', appeared on the cover of North American Whitetail magazine Jan 2005. 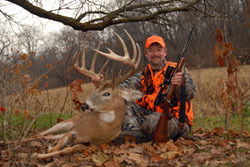 On opening day of the 2009 WI gun season, Larry took yet another giant. 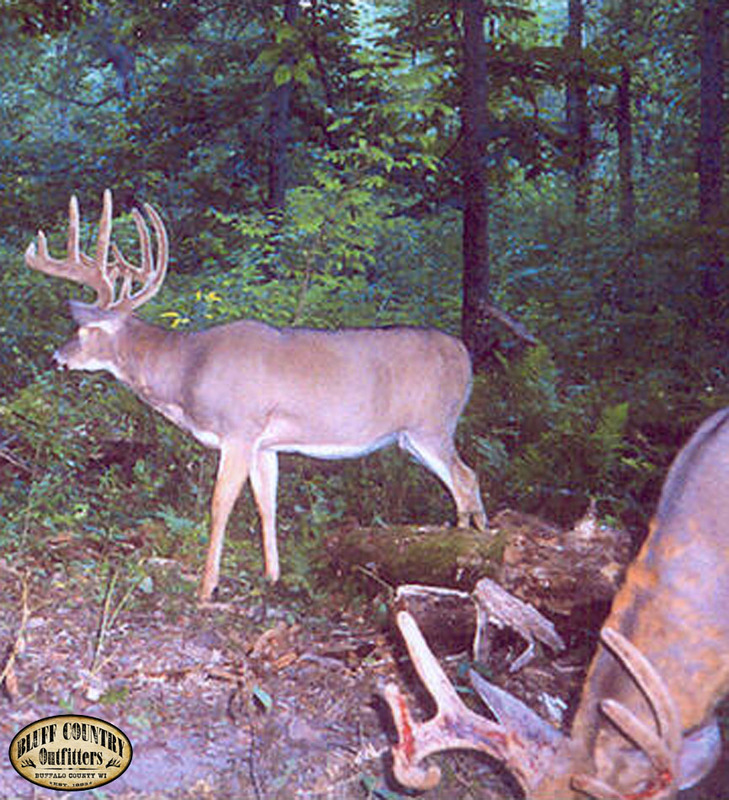 This buck, nicknamed 'The General', was a 14pt typical buck with a green score of 191 it will easily make the B/C record book. 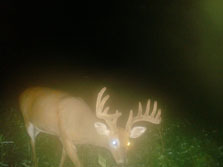 Two other bow hunters had close encounters with it in the early bow season. Both have lasting memory's of the big one that got away. 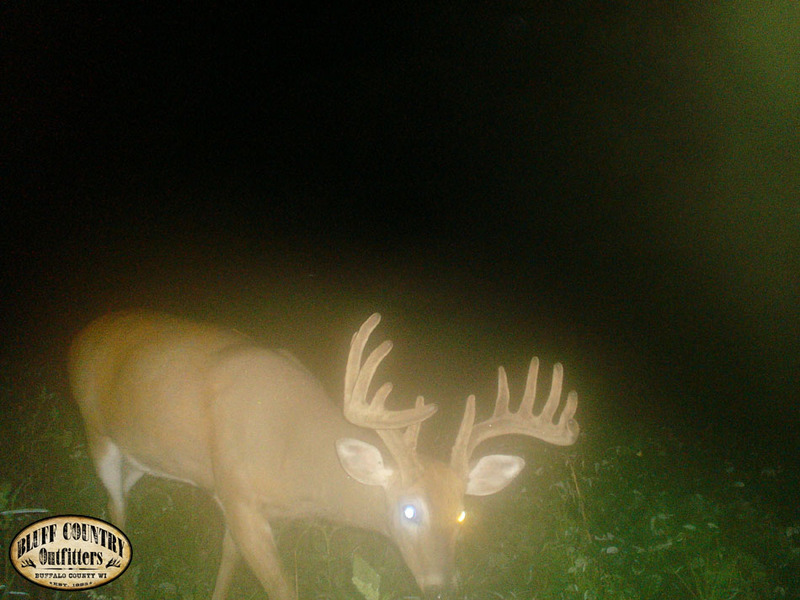 Check out our trail camera shots of 'The General'. Larry we are all happy for you, way to go. 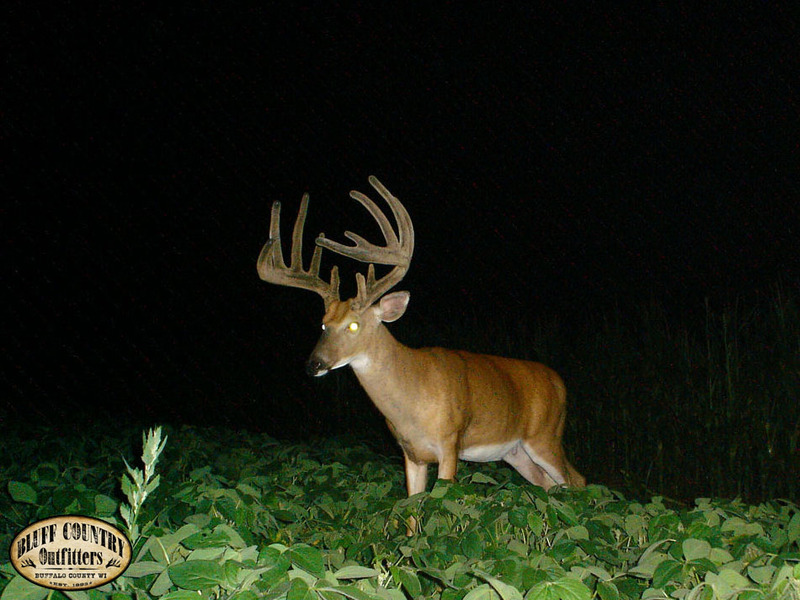 This is the ultimate guide to growing food plots to produce mature bucks and a healthy deer herd. 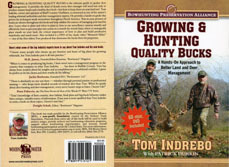 Tom Indrebo provides a hands on guide that proves his techniques work everywhere. 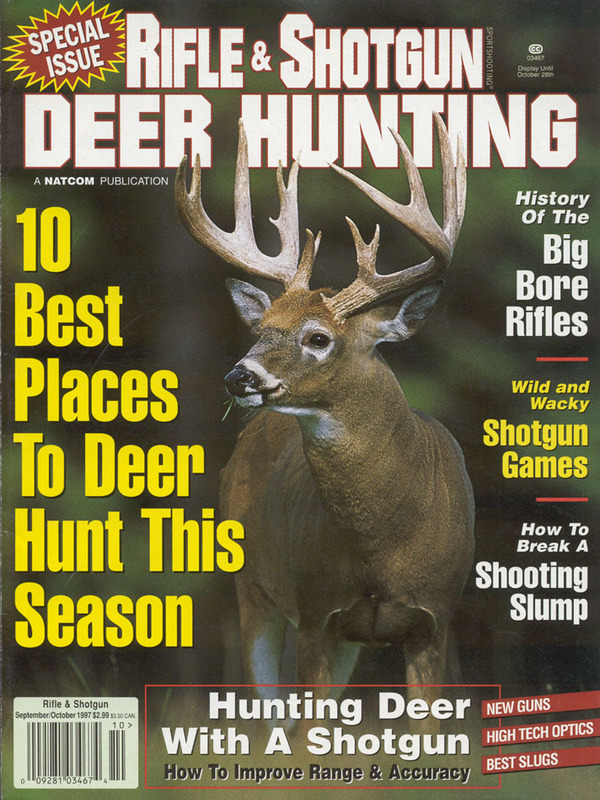 Month-by-month chapters tell you when to plant, how to build a woodland pond, how to test your soil, what foods deer prefer at different times of the year, how to supplement the trees and plants in your area and more. Available in most book stores. 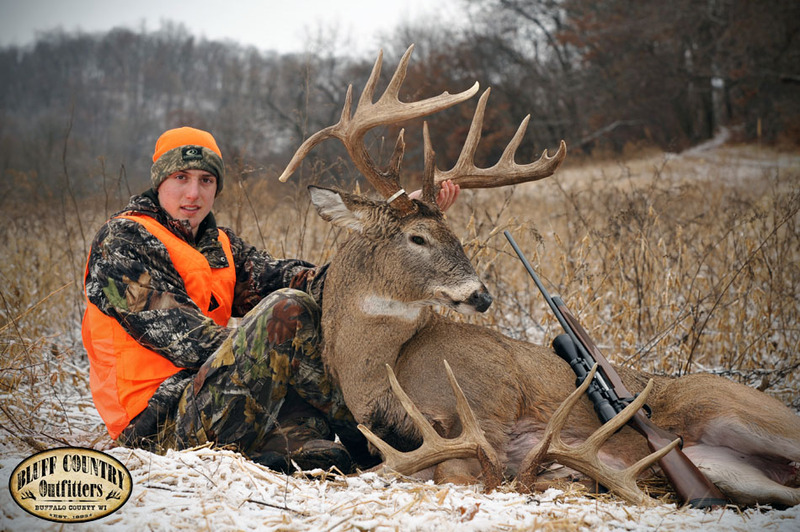 On the second day of the Wisconsin gun season, Trevor Oleson of Wisconsin Rapids, WI, took this giant. 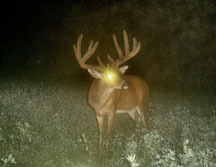 This buck, nicknamed Moses, had been seen and photographed for several years. Several of our hunters had encounters with Moses. John Sligh, of Reddick, Fl, took this 13 pointer. 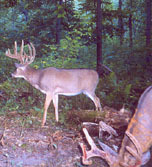 The buck had a live weight of 290 lbs and field dressed 233 lbs. It green scored 164 6/8. 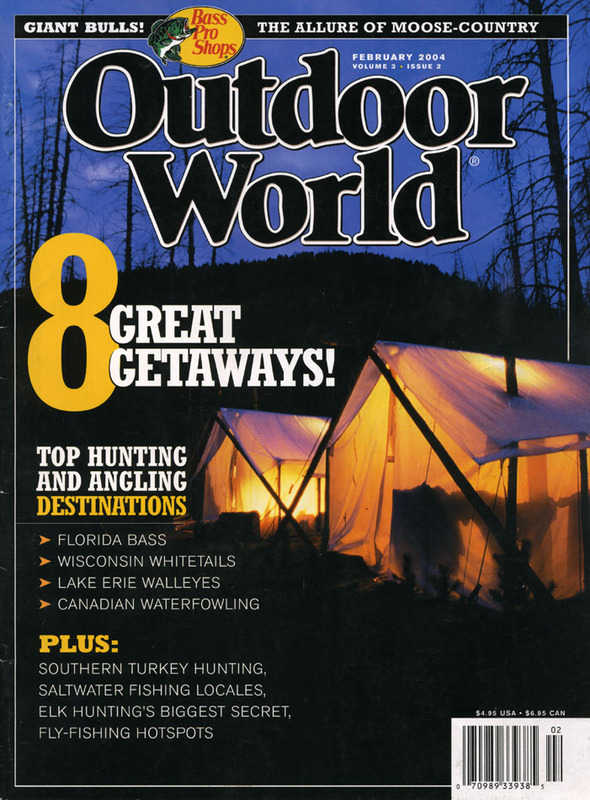 Bluff Country Outfitters were featured in the 2004 February issue of Outdoor World. 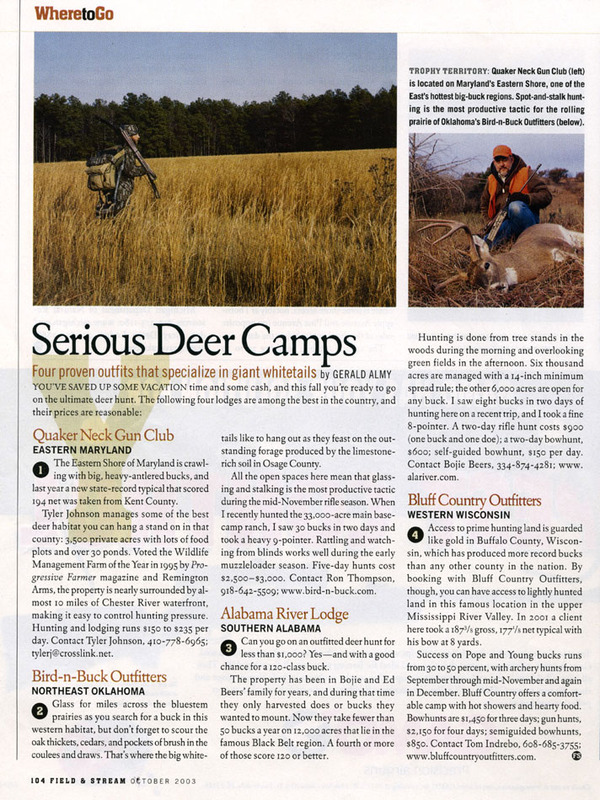 The 2003 October issue of Field & Stream magazine chose Bluff Country Outfitters as of the best in the country. 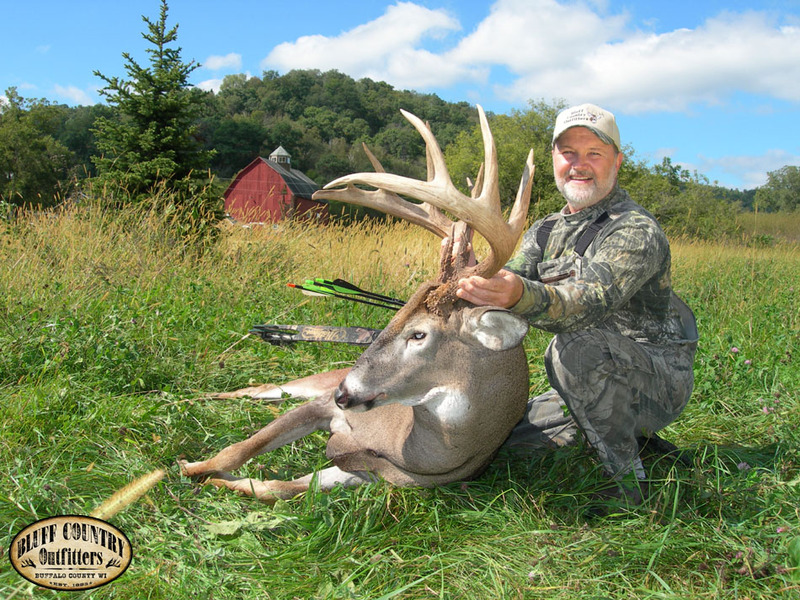 Mark Fehrman of Milton, WV, took this buck November 16th. It grossed 175 5/8 and net scored 173 1/8. It field dressed at 224lbs. We captured this deer on our trail camera earlier this summer. Hunting with Bluff Country Outfitters on November 4th, 2001, Mike Ward of Lake Village, IN, harvested one of Wisconsin’s archery top 10 typicals ever. 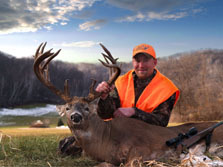 On the first morning of his hunt, Mike said the buck closed the distance within 8 yards when he made his fatal shot. With a gross score of 187 3/8, the buck nets 177 1/8 Boone & Crockett points, placing Mike well into the record book. Friday, October 13, 2000, Ken Shane of St. 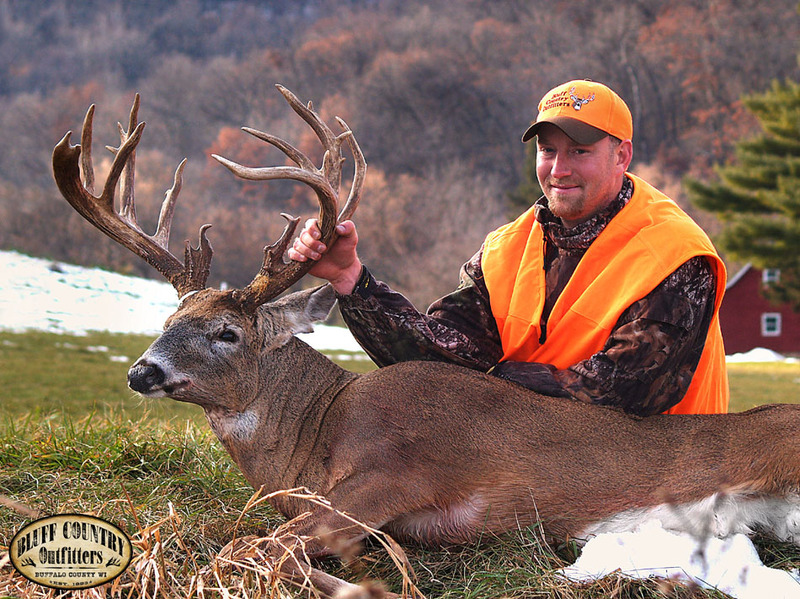 Cloud, MN, harvested this beautiful buck. 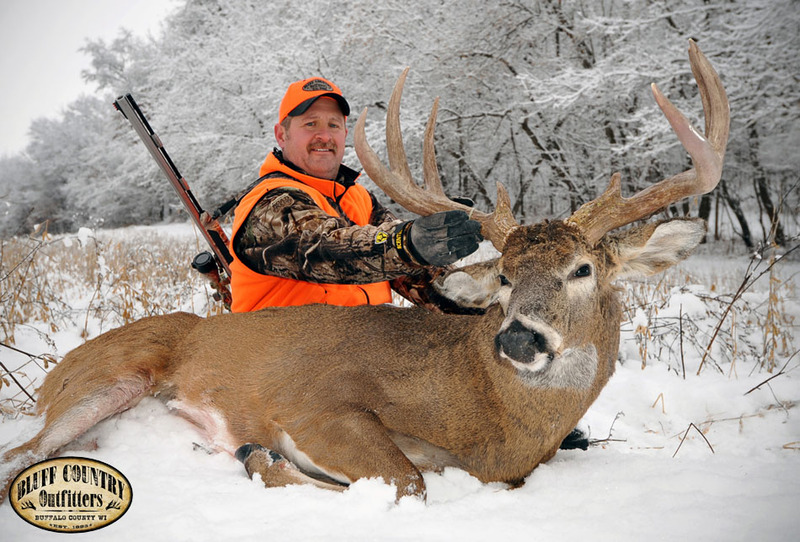 The buck scored 186 6/8 which ties the current state record held by Fred Hoffman of Antigo, WI. 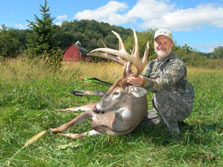 Ken has hunted the area for the past 10 years and took his buck on a neighbor's farm. Congratulations Ken on a dream come true. 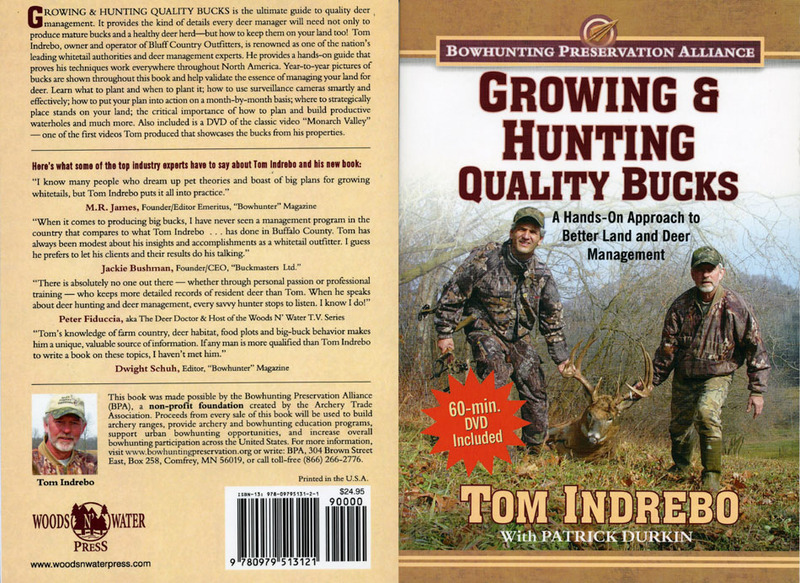 Also, thanks to other hunters and land owners in the area for their combined efforts in Quality Deer Management. 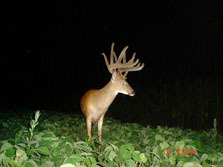 The rewards of producing bucks of this caliber. 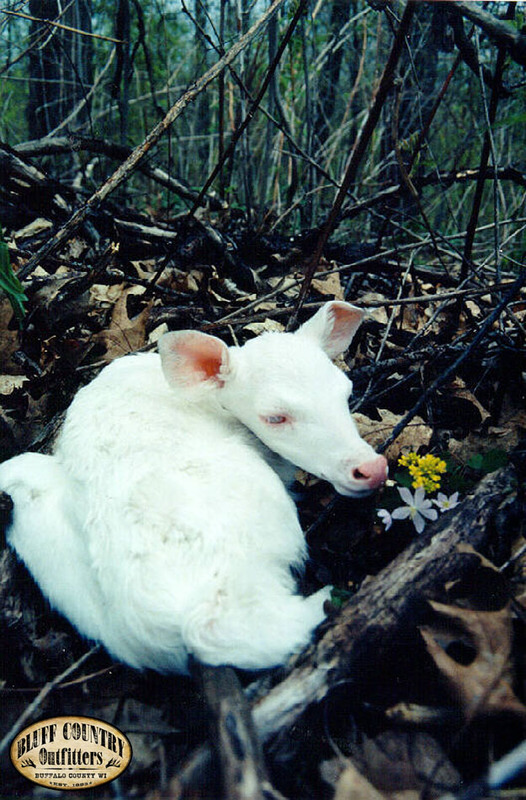 On May 20th, this albino fawn was photographed within one mile from camp. Its natural colored mother was observed nearby. 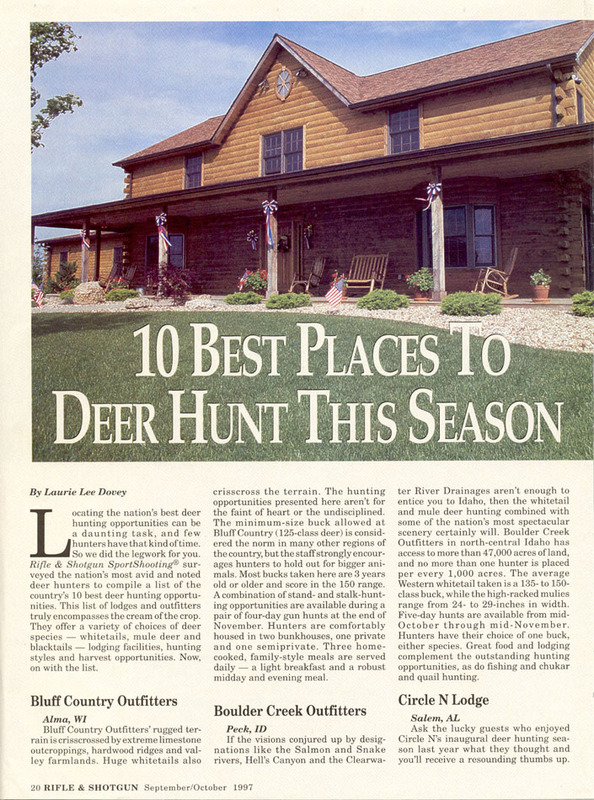 The 1997 September/October issue of Rifle & Shotgun Deer Hunting magazine rated Bluff Country Outfitters one of the 10 best places to deer hunt. 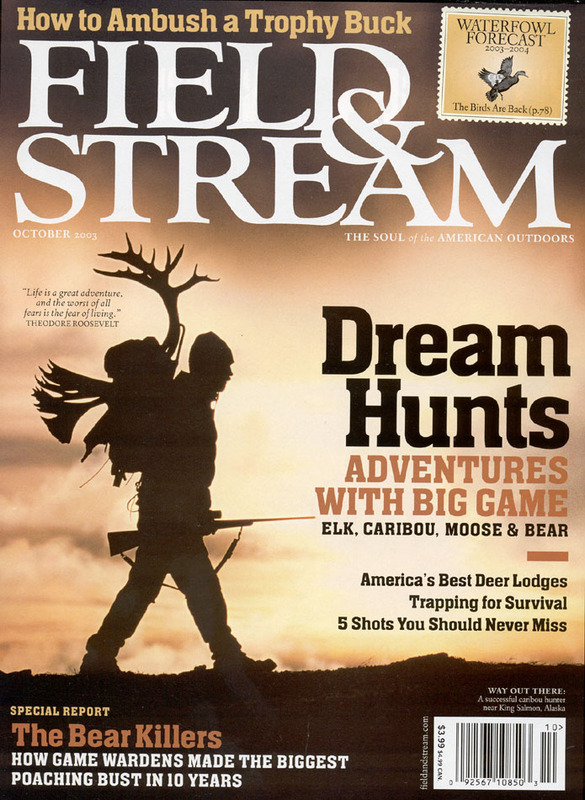 The results of a sweepstakes hunt with Deer and Deer Hunting Magazine, along with Outdoor Writer, Greg Miller, and Dan DeFauw, of Mich. 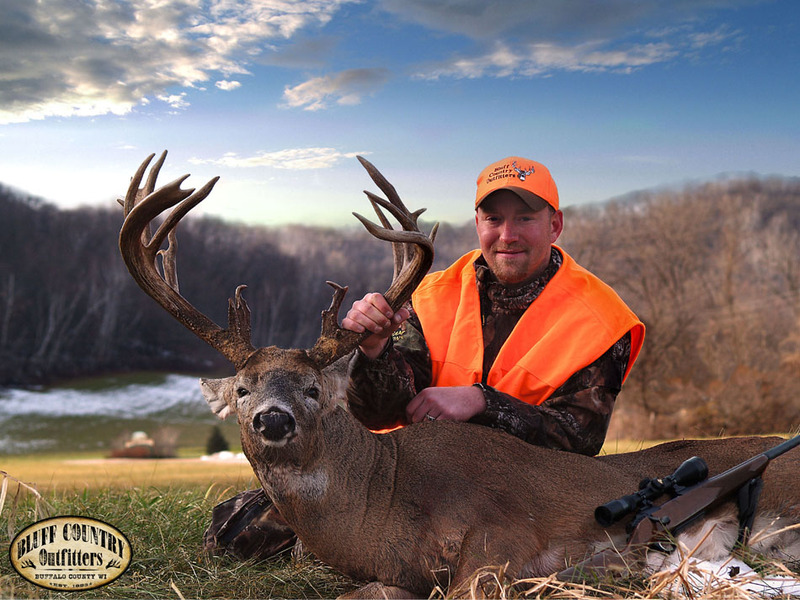 The early October hunt with Bluff Country Outfitters produced Editor, Pat Durkin's best buck to date. 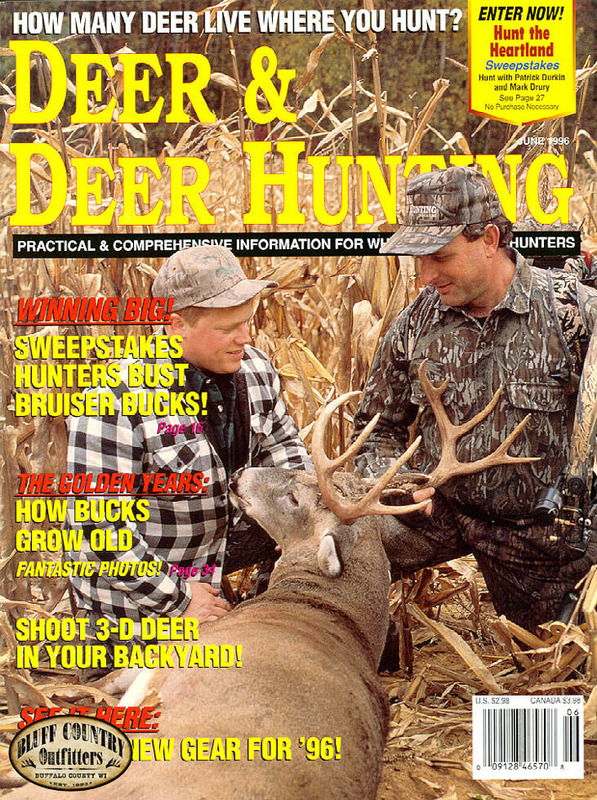 See complete story in the June 1996 issue of Deer and Deer Hunting. Monte Nichols, a 31-year-old salesman, entered the woods on a Friday evening unaware of the situation that was about to unfold. 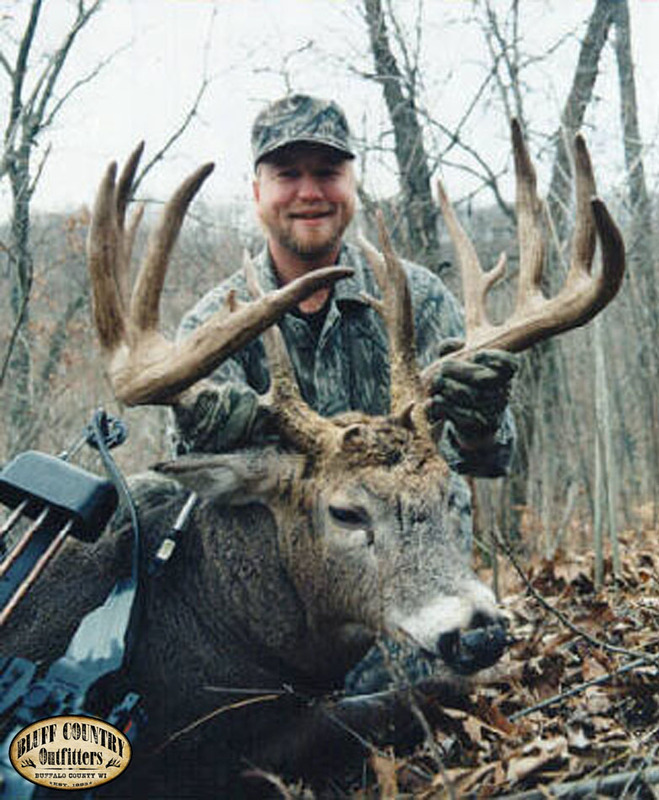 Nichols was hunting in an area that had a series of scrapes in hopes of arrowing his first buck with a bow. 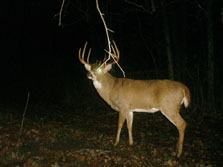 Monty knew that there was a good buck in the general area because of earlier sightings by friends and locals. "I was thinking of having a cigarette when I heard a twig snap off to the side of me. When I looked over in the direction of the noise, the buck of my dreams was standing in the scrape, looking at me!" Nichols said. 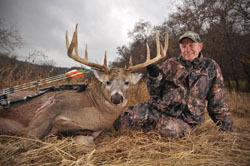 His first reaction was to go for his bow, which was hanging on a limb on the other side of him, but resisted the temptation for fear he would spook the giant buck. "It seemed like the stare-off took hours," he said, when in reality it took seconds before the buck turned his head. 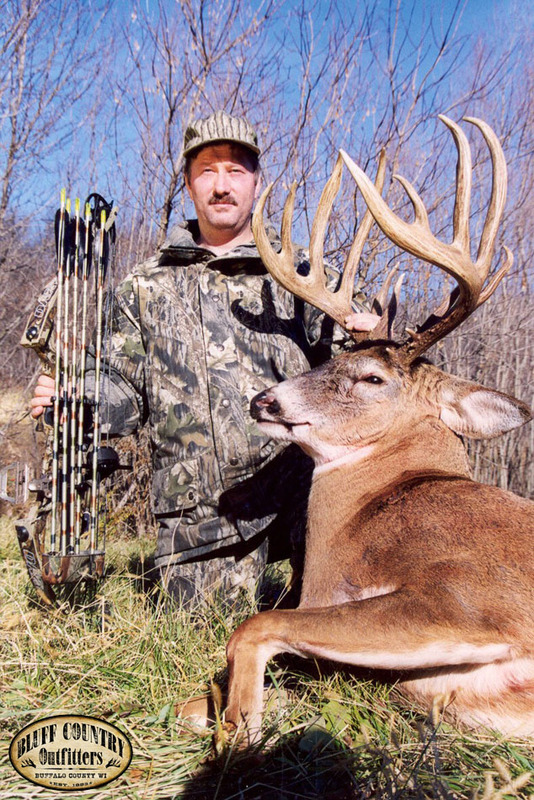 Nichols slowly picked up his bow and drew it back in one fluid motion while the buck faced the opposite direction. Suddenly, the arrow flipped off the rest and made a loud clink! 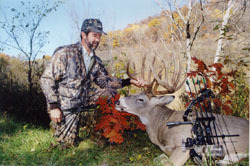 The buck spun around at the sound, giving Nichols a broadside shot at 20 yards. 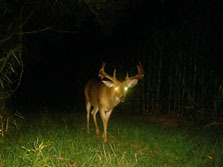 "I wasn't really shaking until then I knew that the buck was at full alert and I tried to get the shot off," Monty recalled. 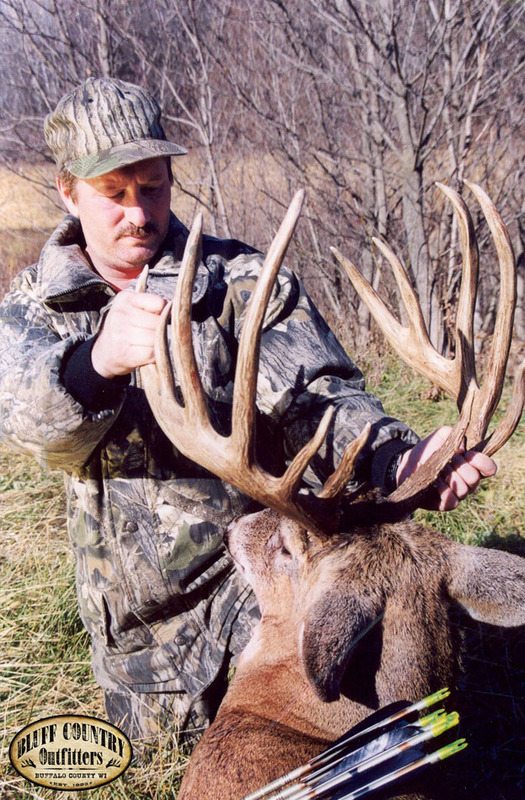 The buck then turned its head away one more time and Nichols came to full draw. 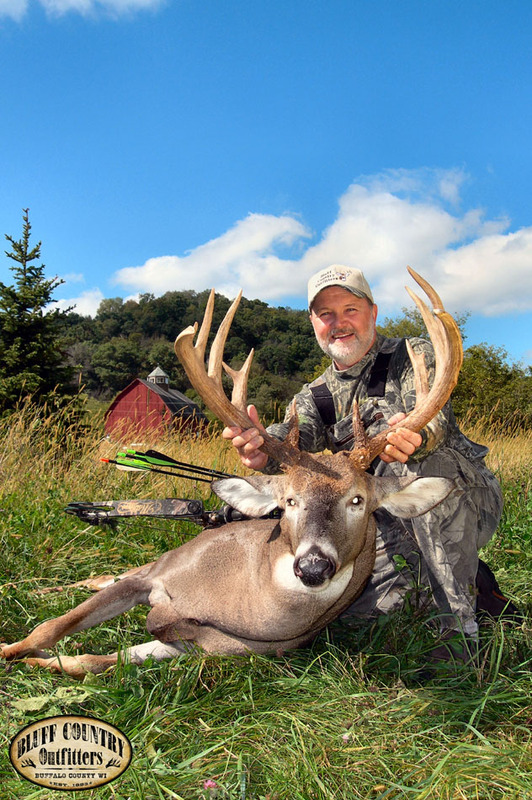 Knowing it was now or never, he rested his 25-yard pin behind the bucks shoulder. 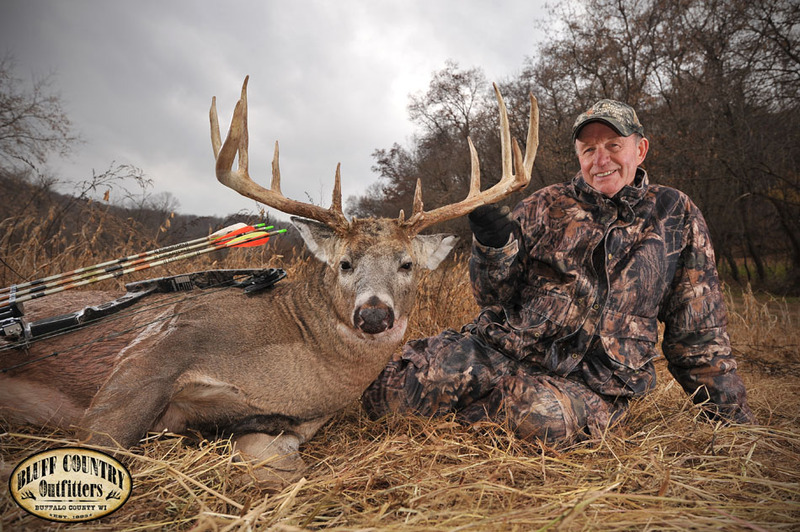 Nichols' arrow found its mark and the buck dropped after a short run. 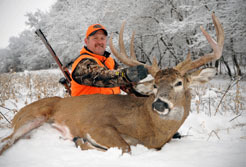 The deer weighed 245 pounds field-dressed and had an inside spread of 23 1/2 inches. 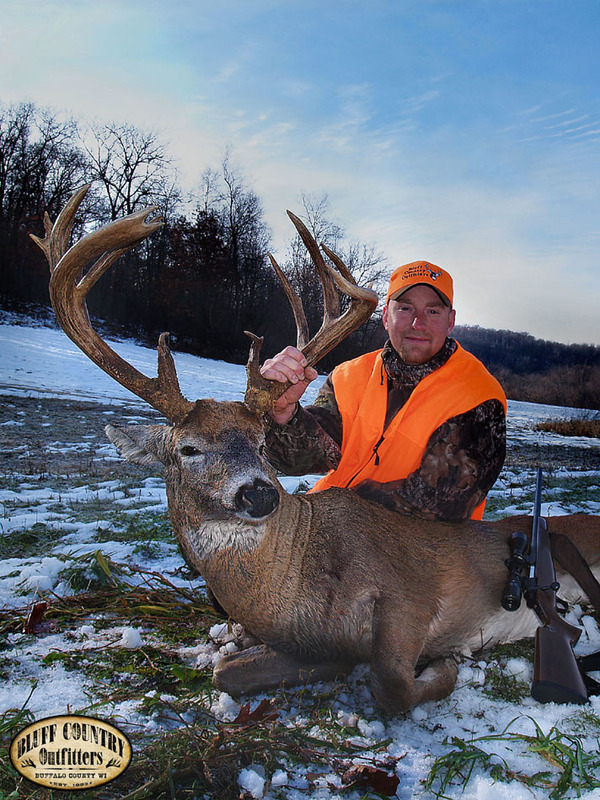 After the 60-day required drying period, the buck scored 206 6/8 non-typical, making it the Wisconsin new No. 6 all time with bow.